We welcome all of our members to come and share about themselves, ask questions and share tips and tricks that learned along the way to help each other make our lives easier and better. The holidays and winter will be here before we know it! All of the extra activities, change in temperature, bad weather can be tough for us so we will also be sharing ways to get though the season safely and with hopefully less stress. We are dedicating this meeting to you, our members. We will not have a guest speaker. We invite you all to come out, have some coffee and a snack, meet and talk with fellow members in a welcoming and understanding environment. This entry was posted in Uncategorized on October 11, 2017 by Krista. This entry was posted in Uncategorized on August 9, 2017 by Krista. This weekend only! Ellen will be giving a special preview of her presentation for this summers conference, if you won’t be able to travel out of state now if the time to see it! 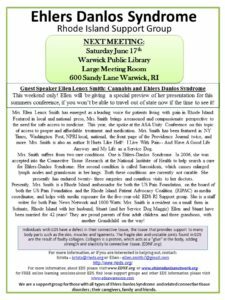 Mrs. Ellen Lenox Smith has emerged as a leading voice for patients living with pain in Rhode Island. Featured in local and national press, Mrs. Smith brings a reasoned and compassionate perspective to the need for safe access to medicine. This year, she spoke at the ASA Unity Conference on this topic of access to proper and affordable treatment and medication. Mrs. Smith has been featured in NY Times, Washington Post, NPRI local, national, the front page of the Providence Journal twice, and more. Mrs. Smith is also an author It Hurts Like Hell! : I Live With Pain– And Have A Good Life Anyway and My Life as a Service Dog. Mrs. Smith suffers from two rare conditions. One is Ehlers-Danlos Syndrome. In 2006, she was accepted into the Connective Tissue Research at the National Institute of Health to help search a cure for Ehlers-Danlos Syndrome. Her second condition is called Sarcoidosis, which causes enlarged lymph nodes and granulomas in her lungs. Both these conditions are currently not curable. She presently has endured twenty- three surgeries and countless visits to her doctors. 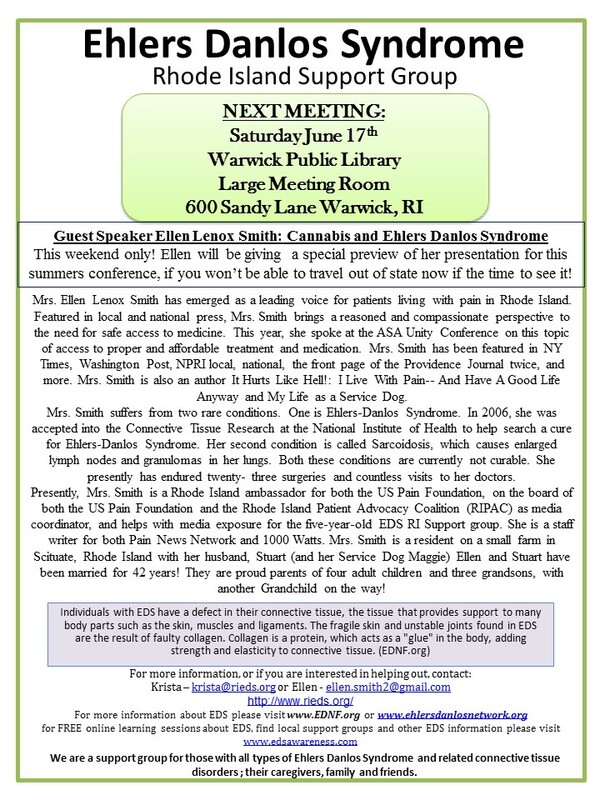 Presently, Mrs. Smith is a Rhode Island ambassador for both the US Pain Foundation, on the board of both the US Pain Foundation and the Rhode Island Patient Advocacy Coalition (RIPAC) as media coordinator, and helps with media exposure for the five-year-old EDS RI Support group. She is a staff writer for both Pain News Network and 1000 Watts. Mrs. Smith is a resident on a small farm in Scituate, Rhode Island with her husband, Stuart (and her Service Dog Maggie) Ellen and Stuart have been married for 42 years! They are proud parents of four adult children and three grandsons, with another Grandchild on the way! This entry was posted in Uncategorized on June 12, 2017 by Krista. 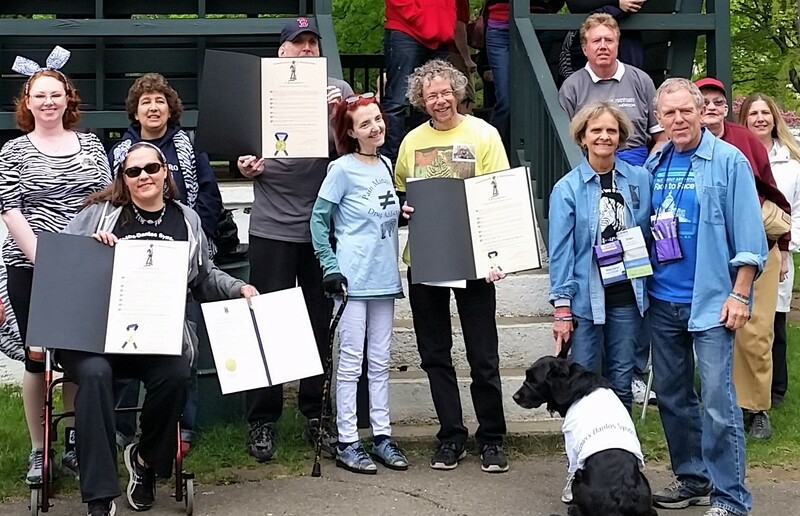 The Boston Walk for Victory is happening this Sunday! (June 11) We at RI EDS will be walking as part of Team Zebra. We have participated in the walk every year so far and are so happy to do it again, especially because this year all the money raised by Team Zebra will go directly to EDS research! We all know how much we need more research and more awareness so help me spread the word about the walk, join us if you can and if possible make a small donation or encourage your friends, family or community to do so. Research is imperative for us to live better, less painful lives and we are so much stronger together! You can register for the walk online until June 9th but will still be able to register in person on the day! The Marfan Foundation works to create a brighter future for everyone living with Marfan syndrome and related disorders. This includes funding research, providing patient support, and conducting public and medical education to ensure that everyone affected is diagnosed and treated. The Walk for Victory helps fund our life-saving programs and services. Join us for our 3rd Annual Boston Walk for Victory and help us raise awareness and advance our life-saving work. This nationwide walk program focuses on community and puts the FUN in fundraising! Grab a friend, join a team, or make your own team and get ready for some fun in the sun. Ehlers-Danlos Syndrome is an incurable, heterogeneous, genetic disorder, resulting in weak connective tissue, (the tissue that makes up skin, bones, blood vessels and other organs). EDS often has early signs and progressive degradation, currently organized in a group of six distinct types that are diagnosed by characteristics, clinical observation, and/or genetic testing. The overall prevalence of Ehlers-Danlos Syndrome is estimated as 1 in 5,000 individuals. My husband Jon, who is the Co-leder of the EDS New England/Massachusetts Support Group and also is the President of the Massachusetts Chapter of the Marfan Foundation, works closely with several EDS support groups and organizations here in New England and throughout the United States to provide support, promote awareness and initiate needed research in improving the quality of life for all individuals and families dealing with a connective tissue disorder. NEW THIS YEAR: We are pleased to announce that ALL $ raised through Team Zebra will go directly to support EDS Research. Support The Marfan Foundation by making a donation to our team. The process is fast, easy, and secure. And you can be sure that it will benefit a great cause! Team Zebra: https://give.marfan.org/fundraise/team?ftid=114446 use this link to join our team, please also share the link and walk information with your social groups! 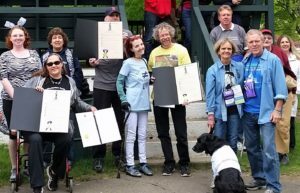 Boston Walk Main Page: https://give.marfan.org/boston/events/2017-boston-walk-for-victory/e116520 Have Marfan or one of the other connective tissue disorders? You can join a team or register as an individual! Enjoy a mile-long leisurely walk and connect with others in your community. Satisfaction in knowing that you are helping to save lives and improve the quality of life for the many thousands of individuals and families living with Marfan syndrome and related disorders. Raise or Donate $100 to receive our 3rd year purple shirt at the walk! Raise $1,000 or more by Walk Day and you will be a part of our National Superstar Circle of Excellence. You will recieve VIP treatment at the walk, as well as recognition at our Annual Family Conference in Minnesota! For more information on Marfan Syndrome and related disorders, visit marfan.org. Thanks so much and I hope to see you there! This entry was posted in Uncategorized on June 5, 2017 by Krista. 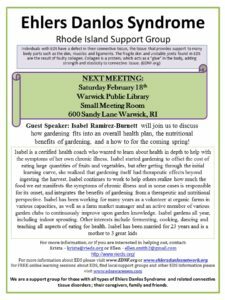 OUR NEXT MEETING IS THIS SATURDAY! 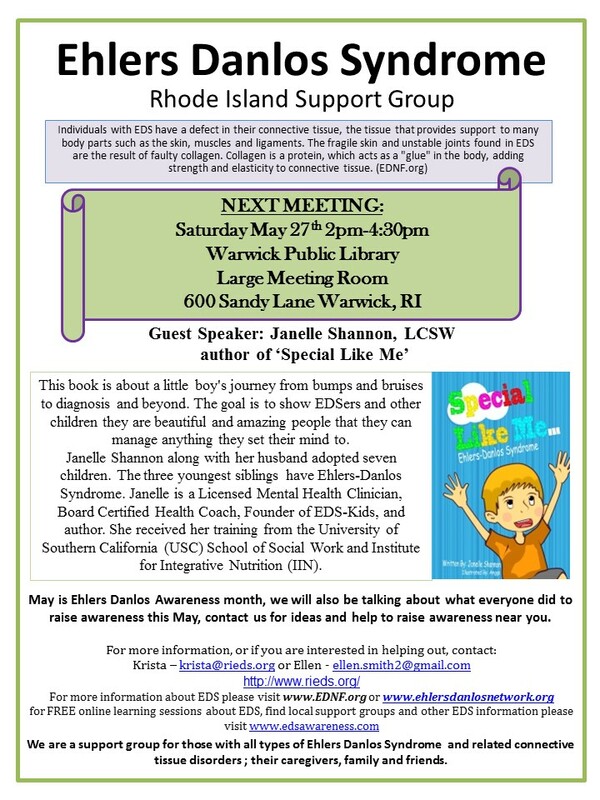 Our June meeting will be held on June 17th 2pm-4pm at the Warwick Public Library in the Large room! Please join us for the annual Marfan Foundation Boston Walk for Victory on June 11th at Boston Common. Join us on the walk (we are Team Zebra!) or just come for a good time raising awareness and making some new friends. It is always a wonderful time! And some wonderful Zebra Prints at Lularoe Wayland Square ! This entry was posted in Uncategorized on May 24, 2017 by Krista. 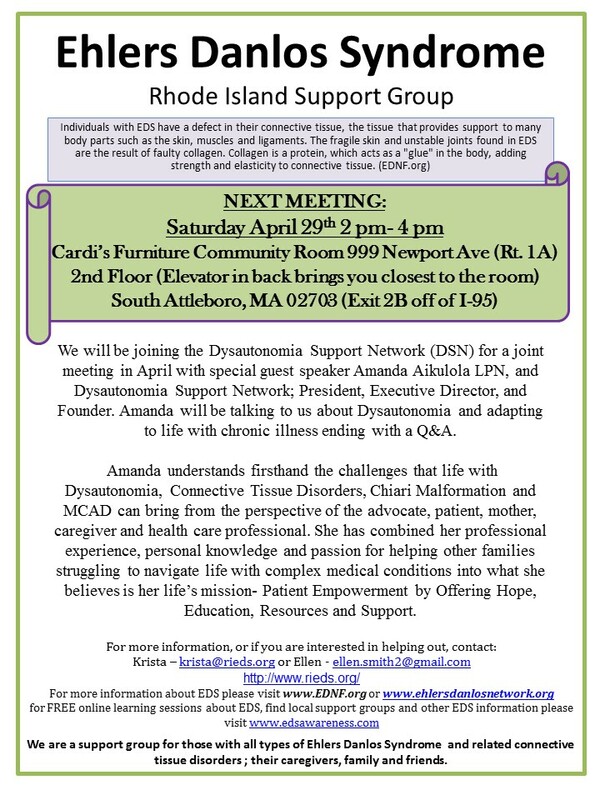 We will be joining the Dysautonomia Support Network (DSN) for a joint meeting in April with special guest speaker Amanda Aikulola LPN, and Dysautonomia Support Network; President, Executive Director, and Founder. 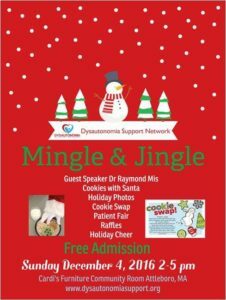 Amanda will be talking to us about Dysautonomia and adapting to life with chronic illness ending with a Q&A. This entry was posted in Uncategorized on April 13, 2017 by Krista. 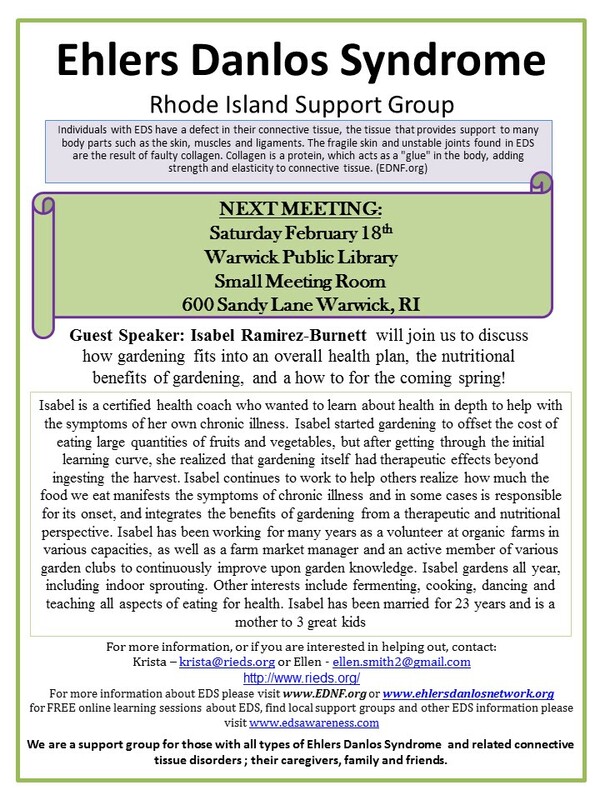 Our next meeting will be on February 18th starting at 2pm in the small meeting room at the Warwick Public Library on Sandy lane. We hope to see you there! This entry was posted in Uncategorized on February 10, 2017 by Krista. 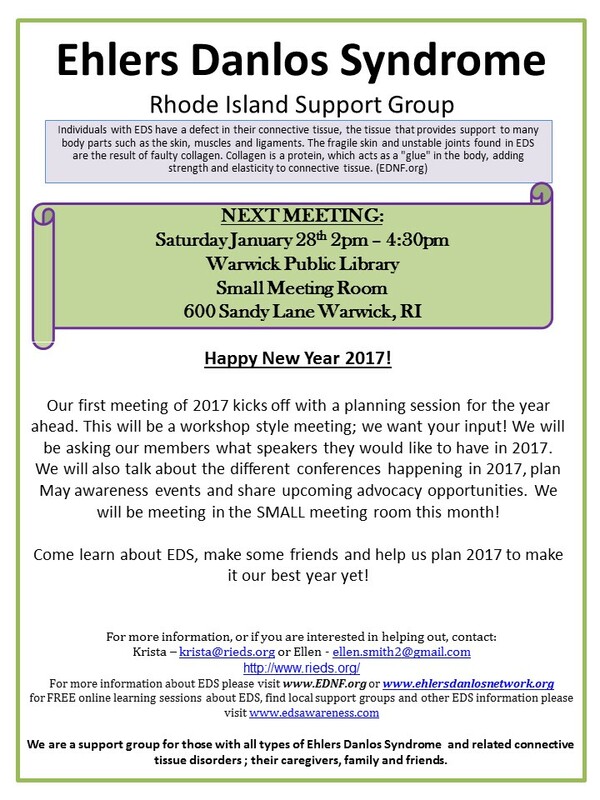 Join us this weekend for our 2017 planning session! TOPIC: Our first meeting of 2017 kicks off with a planning session for the year ahead. This will be a workshop style meeting; we want your input! We will be asking our members what speakers/topics we want to focus on in 2017. We will also talk about the different conferences happening in 2017, plan May awareness events and share upcoming advocacy opportunities. We will be meeting in the SMALL meeting room this month! 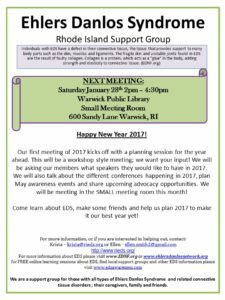 Come learn about EDS, make some friends and help us plan 2017 to make it our best year yet! Rare Disease Day is February 27th! Along with Rare Disease Day February also brings us Marfan Awareness month, please consider helping raise awareness for our sister condition next month. The Marfan Foundation always has wonderfully informative posts to share all month long. LET’S START THINKING ABOUT MAY AWARENESS ACTIVITIES NOW! SEND YOUR IDEAS TO krista@rieds.org OR POST THEM ON FACEBOOK! Would you like to be on our May Awareness Committee? You only need the desire to raise awareness in order to help, materials will be provided! You are all so important to this group, I couldn’t be happier with our group and how we are here to help each other and find support together, I thank you all for joining us for another year! This entry was posted in Uncategorized on January 26, 2017 by Krista. Our first meeting of 2017 kicks off with a planning session for the year ahead. This will be a workshop style meeting; we want your input! We will be asking our members what speakers they would like to have in 2017. We will also talk about the different conferences happening in 2017, plan May awareness events and share upcoming advocacy opportunities. We will be meeting in the SMALL meeting room this month! 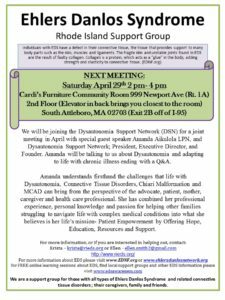 If you are in the MA/Boston there is a meeting happening this weekend! 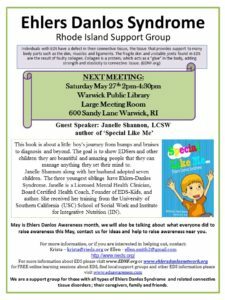 -On December 11th , we will hold a Joint Meeting of the Ehlers-Danlos New England/Massachusetts Support Group and the Massachusetts Chapter of the Marfan Foundation. After the break, we will have our third ‘Share n Care’ program that will be a time for everyone to share anything that has helped improve the quality of their life and or care through the years. We encourage attendees to bring items that they can talk about and share with all our members. After our “Share-n-Care’ , we will take another short break. (around 2:45 PM – 3 PM) Following our 2nd break, we will have plenty of time for our general session to discuss any topics our members wish to engage in. Our meetings are a wonderful opportunity to not only learn more about what is going on in the medical and research community but to also meet and talk, share experiences and support one another. Please RSVP if you are planning to attend to wsalmgcdjm@comcast.net. Also, don’t hesitate to contact us with any questions. This entry was posted in Uncategorized on December 8, 2016 by Krista. RI EDS WISHES EVERYONE SAFE AND HAPPY HOLIDAYS! 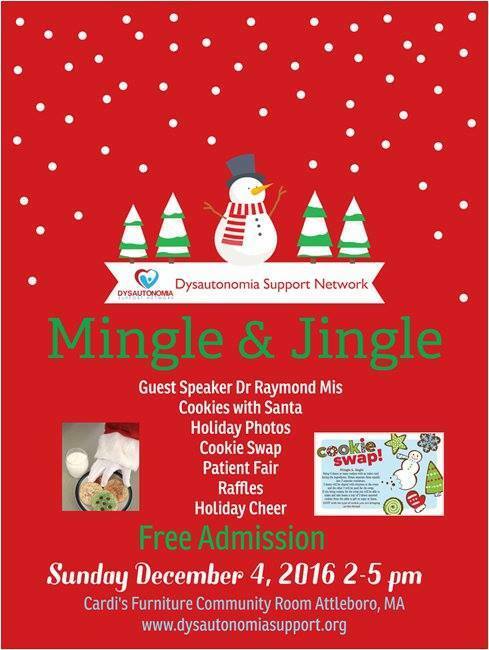 This weekend we will be at the annual Dysautonomia Support Network’s holiday party, Join us!! This entry was posted in Uncategorized on November 29, 2016 by Krista.